The Spanish prime minister has rejected a call from Catalonia's leader for fiscal independence, days after a giant pro-autonomy rally in Barcelona. Mariano Rajoy received Artur Mas for talks in Madrid at which he told him that Spain's economic crisis had to be overcome jointly, a statement said. The crisis has fanned an independence movement in Catalonia, which produces a fifth of Spain's economic output. 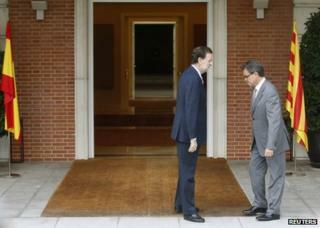 Correspondents say Mr Rajoy is wary of any of Spain's regions seeking to break away amid the economic crisis. Mr Mas went into talks with the prime minister on granting Catalonia powers to raise and spend its own taxes. Pro-autonomy leaders argue that Catalonia pays a disproportionate level of taxes to Madrid in relation to the central funding it receives. "Rajoy showed his opposition to the proposal for an economic accord for Catalonia because it is not compatible with the Spanish constitution," the prime minister's office said in a statement. He told Mr Mas that the "very serious crisis [would] be overcome through joint responsibility and unity, never through division or institutional instability". "We lost an historic opportunity in the understanding between Catalonia and the rest of Spain," Mr Mas said after the meeting. "I would have liked to be able to say that there was room for negotiation but the head of government himself told me that he saw no way forward for the fiscal pact." "If the negative answer to the fiscal pact is so obvious, then we will have to take decisions in the next days," he added. Asked about the possibility of calling early elections, he said: "All options are open." A decision on early polls could be taken as early as next week when the regional parliament holds its annual debate on the state of Catalonia. Several Spanish newspapers said Mr Mas could call snap elections for 25 November. The Spanish constitution bars any actual referendum on independence for Catalonia, which has its own language. Mr Rajoy's centre-right Popular Party won a resounding victory in Spain's general election in November, in a vote dominated by the debt crisis.